What would you do if your child stopped eating? 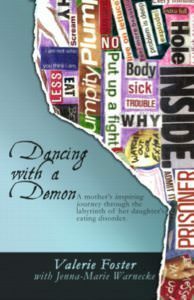 Named BEST NONFICTION NARRATIVE by the American Book Fest, and FINALIST in the International Book Awards, author Valerie Foster’s memoir, Dancing with a Demon, chronicles her family’s extraordinary story. Valerie Foster is an educator, public speaker, and a recipient of the Shofar Zakhor award for Holocaust Education. Her first published memoir was the internationally recognized The Risk of Sorrow: Conversations with Holocaust Survivor, Helen Handler, called an “instant classic in post-Holocaust survivor stores,” and her short story, “Loss,” was published in the River Poets Anthology.